You can find fluorescent light bulbs on most work sites. Do you know what to do if one breaks? It’s a detailed process that needs to be followed to help to reduce the risks, injuries and illnesses that are associated with mercury exposure. Officials with the Occupational Safety and Health Administration (OSHA) recently announced two new educational resources to help workers working near these bulbs and for workers who are employed to crush and recycle the bulbs. The truth is that fluorescent bulbs are more efficient than other bulbs, but they’re also much more dangerous. Inside one of these bulbs is the chemical mercury. When exposed to dangerous levels of this chemical, you run the risks of some serious and life-altering injuries and illnesses. Our Braintree workers’ compensation attorneys understand that mercury is a hazardous metal that needs to be treated with the utmost care and safety. Employees who work directly with this metal need to be cautious, need safety procedures in place and need to have an emergency plan. 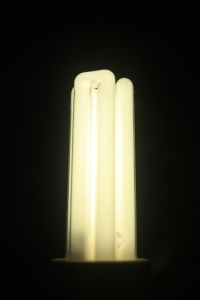 When a fluorescent bulb breaks, the risk of mercury exposure is also present. When inhaled, ingested or touched, it can cause serious illnesses, including troubles with your entire nervous system, your kidneys and even harm to unborn children. When a fluorescent bulb breaks, mercury in the glass tube is released and a small amount of mercury vapor enters the air. A small amount of liquid mercury falls to the ground, where is continues to evaporate to form a vapor. Workers are primarily exposed by breathing in vapors. Exposure can also occur by skin contact. -Never use a broom. Brooms only work to spread around the mercury. -You don’t want to use a vacuum cleaner unless it is specifically for the use of collecting mercury and other dangerous materials. -Never make direct contact with broken glass. You want to be careful when handling these bulbs and mercury. It’s better to work over hard surfaces. Spilling mercury into carpet makes for a tough cleanup. You also want to work in areas that are well ventilated. Employers should also consider monitoring the air quality. You want to make sure that mercury levels never become dangerous. Consider offering workers who handle fluorescent bulbs regularly with respiratory protection. You can check out the fact sheet or the Quick Card for even more information regarding fluorescent bulbs, dangerous mercury exposure and ways to safely handle the two. Train employees about the dangers of mercury exposure, safe ways to work with fluorescent bulbs and the proper ways to dispose of it. Make sure the work area is proper ventilated and that there’s an adequate air filtration system. The Braintree workers’ compensation attorneys at the Law Offices of Jeffrey S. Glassman, LLC can be reached at 1-877-617-5333. Call for a free and confidential consultation to discuss your rights.